The Toxic Avenger is a 1984 American superhero horror comedy film directed by Michael Herz and Lloyd Kaufman (credited as Samuel Weil) and written by Kaufman and Joe Ritter. The film was released by Troma Entertainment, known for producing low budget B-movies with campy concepts and gruesome violence. 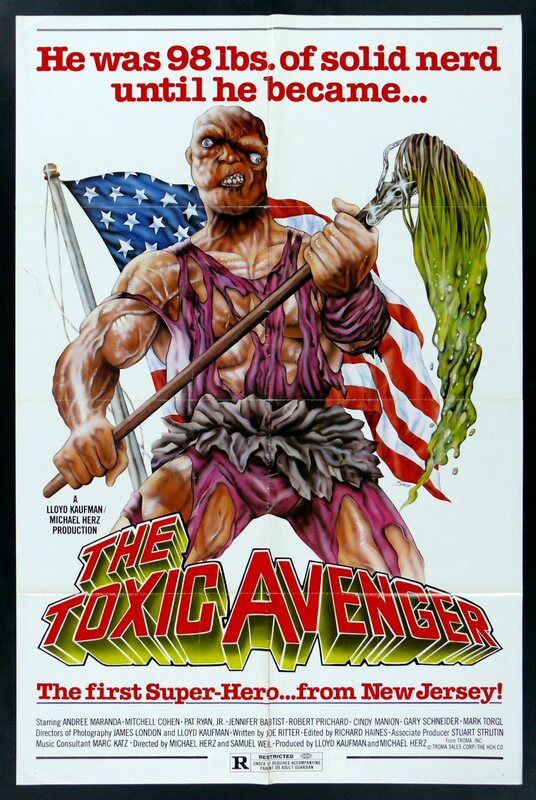 Virtually ignored upon its first release, The Toxic Avenger caught on with filmgoers after a long and successful midnight movie engagement at the famed Bleecker Street Cinemas in New York City in late 1985. It now is regarded as a cult classic. The film has generated three film sequels, a stage musical production and a children's TV cartoon. Two less successful sequels, The Toxic Avenger Part II and The Toxic Avenger Part III: The Last Temptation of Toxie, were filmed as one. Director Lloyd Kaufman realized that he had shot far too much footage for one film and re-edited it into two. A third independent sequel was also released, titled Citizen Toxie: The Toxic Avenger IV. A fourth sequel entitled The Toxic Avenger 5: Toxic Twins is planned for a future release. An animated children's TV series spin-off, Toxic Crusaders, featured Toxie as the leader of a team of mutated superheroes who fought against evil alien polluters. The cartoon series was short-lived and quickly cancelled. New Line Cinema had planned a live-action film based on the cartoon, but the deal fell through.